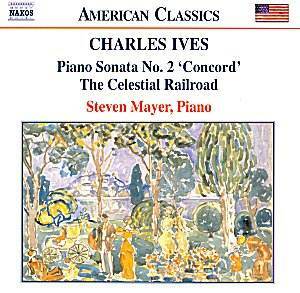 Ives� Concord sonata, a four movement work lasting over 50 minutes, is a remarkable achievement. Originally the music was intended to be for a series of orchestral works celebrating the work of Ives�s favourite writers and the work they produced in Concord, Massachusetts during the period 1840-1860. During the 1910s he changed track and composed this sonata which he then had published at his own expense in 1921. He described the work as "impressionistic pictures of Emerson and Thoreau, a sketch of the Alcotts and a scherzo ... [for Hawthorne]". It is clearly a ferociously difficult piece to play and, like much of Ives�s work, did not easily find a place in the repertoire. However, this new recording, issued at the time of the 50th anniversary of his death, now has a fair amount of recorded competition - there are at least six other versions in the catalogue plus a recent release by Pierre-Laurent Aimard. The first movement, "Emerson", is the most substantial and the most dissonant - a struggle, although there are reflective moments. It is followed by the "Hawthorne" scherzo, swifter and somewhat lighter in vein but still containing lots of notes. After half an hour of intensely concentrated argument "The Alcotts" brings six minutes or so of relatively light relief and a well-known theme (the Hymn tune Martyn). The finale, "Thoreau", provides a fitting closure � intense, predominantly in slow tempi and ultimately disappearing into infinity. This work was new to me but, having heard it several times now, I find it difficult to think of a greater 20th century piano sonata � a modern Hammerklavier. Further information on the work and on those who inspired it (including pictures) can be found using the link below. I am not familiar with any of the recorded competition and understand that Aimard has a special affinity with this work. However, on its own merits, the performance of Steven Mayer (a former Professor of Piano at the Manhattan School of Music) is quite masterly. He clearly believes in the work and is convincing at every turn. The fill-ups and cost might well be the deciding factors in choosing a version. Aimard�s full price disc has Susan Graham singing a selection of songs by Ives. Whilst that sounds attractive, Mayer�s super-bargain disc logically includes two further spin-offs from the original material for the Sonata � the Emerson Transcription No. 1 and The Celestial Railroad. The Varied Air and Variations is a later work, from the mid-1920s, presenting five variations on an atonal theme. In the booklet, H. Wiley Hitchcock describes this as an "angry (if humorous) parody of a pianist�s recital situation", and suggests that it was written in response to Ives� failure to get the Concord sonata performed (this finally took place in 1938). The recorded sound is excellent and documentation well up to standard. Recommended with great enthusiasm � this would be a fiver very well spent.